Need Help Solving Or Finding The Solution To The Following Darboux System Of Nonlinear Equations. I am working on a personal math project of mine and in order for me to continue I need to know the solution to this following system of nonlinear equations I am attaching as a photo. 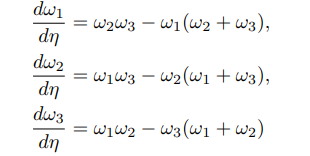 This equation is referenced in this paper https://arxiv.org/pdf/gr-qc/9409025.pdf and the solution is further referenced in F. J. Bureau, Sur des systemes diff´erentiels du troisieme ordre et les ´equations diff´erentielles associ´ees, Bulletin de la Classe des Sciences LXXIII (1987) 335–353. My native language is Japanese and I can't read a word of french to save my life. In addition I can't even find this book or paper. I looked using two college libraries and Google Scholars. I would rather not need to duplicate effort and re derive the solution of these equations in terms of Hermite modular elliptic functions. If anyone who has worked with these equations before has reference with an English solution that would be nice. Or if anyone knows where I can find the french reference that would help also. If non can be found then I would appreciate any hints on how to re derive the solution. My project did not intend to run into such formidable looking differential equation, it is a bit outside of my specialty of geometry. Any guidance will be appreciated thanks! Browse other questions tagged ordinary-differential-equations systems-of-equations riemann-sum or ask your own question. Solving a nonlinear system of equations. Need help with the following differential equations.